These are one of my favorite bar cookies. I might even like these more than regular s’mores. I’ve tried making them with regular marshmallows, and they just disappear into the dough, so be sure to use marshmallow cream. It does tend to ooze out of the bars once they’re cut, but s’mores are supposed to be messy! And with this recipe, you can have them year round. Press half of the dough evenly in the pan. Spread marshmallow cream over the dough. Lay the chocolate bars on top of the marshmallow creme, breaking apart as needed to create an even layer of chocolate. Spread remaining dough over the chocolate bars. Bake for 25-30 minutes. Cool completely before cutting into squares. the hubs leaves again. I love s’mores! Oh, hey! Thanks for the reminder…I haven’t made this in a year or so and they are much too good to allow that much time to pass between batches. As a matter of fact I’ll go right ahead and say it. I like these better than s’mores! MMmmm these look so good! I cant wait to try these! Oh my goodness these sounds amazing! 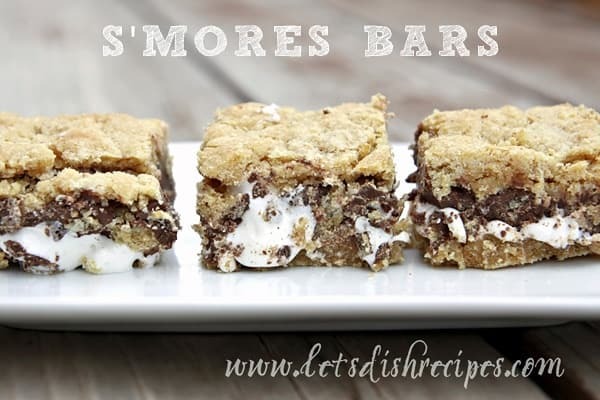 I have another smores bar recipe saved on my list, but I think this one looks even better!! I have to try these out very soon! I made these a couple nights ago, too! They are UNREAL! Yum! Will be making them again! Great picture! A great take on a classic treat! YUM! my kids adore these. i love making these for a huge crowd! they are super yummy! I just saw this recipe in the new family fun magazine…i have a different version and am debating which one to make this weekend…for camping! These look fantastic. I just love s’mores in any shape or form. Who needs a campfire? These look great! These look yummy! I love how fluffy the marshmallow part looks!! Looks like it would be a lot easier to eat than a camp fire s’more. I’ve seen so many different S’more recipes latey and they all looks so good and sticky. A great dessert for Summer. Made these tonight and they are already 1/2 gone! Delish! I’m so craving chocolate, I so want one now!!!! Thanks! made these this weekend I didnt have the marshmellow cream and so I had to use regular marshmellows it was still good but I think it would be great with the cream. Thanks for the recipie. Made these yesterday and brought them to a get together. They were SOOOO delicious…everyone loved them and there were no leftovers (boo). I will definitely make them again! OH MY GOSH! I’ve been on a s’more kick all summer. These have just bumped a bunch of other things on my to make list. Thank you sooooo much for sharing these! I finally got around to baking these this afternoon..WOW are they delicious!! 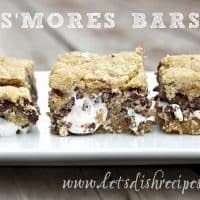 I think I prefer these over the regular s’mores..thank you so much for a keeper of a recipe!!! Good blogger etiquette should always be used! ive decided i MUST make these… i will let you know how they turn out! These were Delish!!! I am adding your link on my blog post! Thanks! Excited to hear you are making the switch!!! YAY! That should be really great for you. These look amazing!!! I have been thinking of making something like this for a while now- just trying to decide how I want to do it. 🙂 You know how that goes. Have a great weekend Danelle!